The green landscape which borders the Royal Canadian Mint in the City on Winnipeg, Manitoba, highlights the rose colored exterior of the modernized building. The landscape surrounding the Royal Canadian Mint in the City of Winnipeg, Manitoba flourishes in its vibrant green hues as the uniquely designed building, home to the mint, rises above. To the left of the Royal Canadian Mint, two Canadian flags blow in the breeze as the summer skies and brilliant sunlight, reflect off the exterior of the building. This building has been operating since 1976 as the original mint in Ottawa became to small to handle the entire process of coin making. 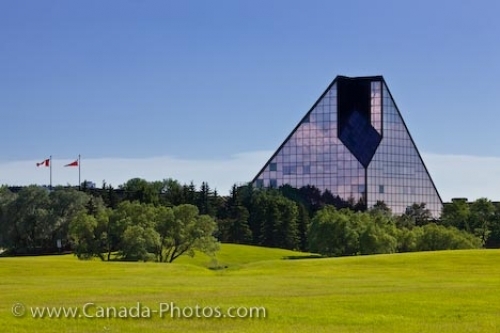 The exterior of the triangular shaped building is adorned in glass and when the sunlight reflects off it, the reflections around the area are prominently displayed on the building. Picture of the green landscape highlighting the exterior of the Royal Canadian Mint in Winnipeg, Manitoba. ... Visitors to the city, can partake in one of the guided tours which explains everything about the process of money making and the beauty of this modernized building.